THE KOREAN BBQ BREAKFAST BOWL!!!!!!!! 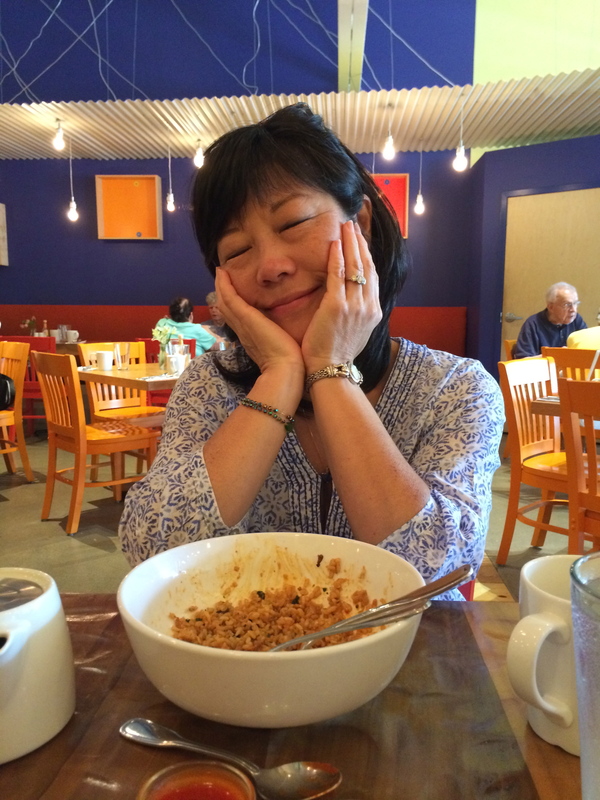 My mom and I agreed – this is the best version of this dish that we have ever had. If I were to make a list of the best things I’ve ever eaten, this would be on the list. That’s how good it was. I should probably tell you what was in it: Korean BBQ braised pork shoulder, brown rice, mushrooms, broccoli, spinach, marinated soybean sprouts, swiss chard, kale, sliced radish, green onion, (real) kimchi, and an over-easy egg. Look how beautiful this dish is! The bright green from the broccoli against the white from the egg, and of course the pink rimmed radish. It looks stunning, and that is before you even take your first bite. 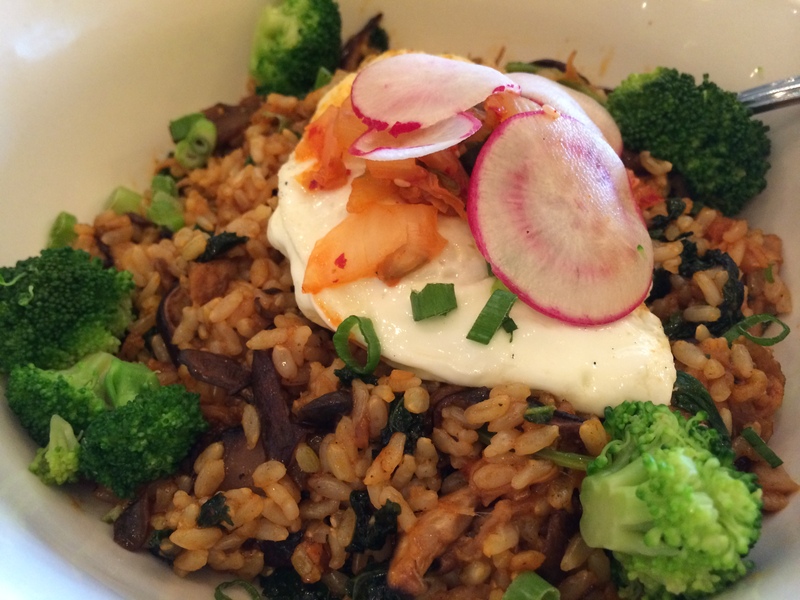 Brown rice was definitely the way to go with this dish. Not only is it healthier than the traditional white rice normally served with bibimpap, but it added a chewy nuttiness to the dish. 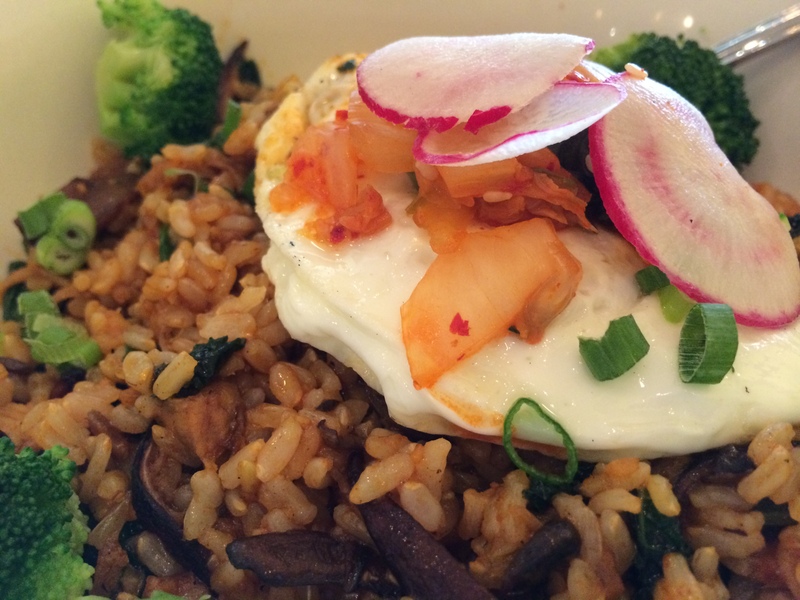 The egg yolk dribbled out into the rice, making the entire dish even more creamy. The braised pork literally melted in my mouth. AND this bowl was packed with veggies! No skimping at all!!! We enjoyed our lunch with hot mugs of green tea. This dish is big, and of course very filling with all the rice. Nevertheless, we knew this would not make it back home, as it was too spicy for Dad and the kimchi would stink up his car (flashback to 2 years ago when we left a sealed jar of kimchi in Christine’s car overnight . . . big mistake). As such, we made sure to pick out all the delicious bits before we finally leaned back and breathed deep sighs of satisfaction.